Join the HPA House Cup Marathon! Thanks for backing the Harry Potter Alliance and Neville Fights Back! Yay Hufflepuff! Thank you for backing Neville Fights Back and the Harry Potter Alliance! Thank you for your support of the Harry Potter Alliance and Neville Fights Back! Thank you for your support of Neville Fights Back and the Harry Potter Alliance! Let's make that a nice even number. EDIT: OR NOT. $25 IT IS. Thank You for the support! Fly eagles 🦅 Fly! Go Blue! You are so awesome! Love you! Thanks for all you do! Keep up the good work! Keep up the amazing work, Eagles! Birds of a feather flock/walk/run/roll together! Thank you for your support! Walking right now. Blue eagles 🦅 flying high! Hufflepuffs make the best friends! Go Blue and Bronze! Keep walking! Thank You Jan for your support! I LOVE THIS FANDOM! Thanks all for showing up and inspiring me with this community (every year!) Blessings! The answer to the ultimate question of life, the universe, and everything. Thank you! Thank You Justin for your support! Laugh hard, run fast, be kind! Go Joy, Go!! Go team yellow & black! Good luck racing! Wishing you firm footing and a cool breeze at your back. Thank you my Sistah and my Brother! In honor of Moe, who would be so proud of you. ❤️ Much love! This race ended 08/30/18 - check out the final activity below. #17 ultramarathoner. #51 runner. #545 fundraiser. #4 team fundraisers. #164 ultramarathoner. #306 runner. #567 fundraiser. #4 team fundraisers. #450 runner. #3 team fundraisers. 3rd Longest personal run. Finished in 450th place. Ran 26.2 miles (+0.4 miles) in 23 days a PR. #475 runner. #3 team fundraisers. Longest personal run. Passed 33 runners. #49 ultramarathoner. #108 runner. #63 fundraiser. #2 team fundraisers. #508 runner. #3 team fundraisers. 3rd Longest personal run of this race. Passed 19 runners. #527 runner. #3 team fundraisers. Back after 22 days. 3rd Longest personal run. Passed 26 runners. #94 ultramarathoner. #190 runner. #283 fundraiser. #2 team fundraisers. #109 ultramarathoner. #195 runner. #289 fundraiser. #2 team fundraisers. 5th Longest personal run. #83 ultramarathoner. #152 runner. #125 fundraiser. #1 team fundraisers. #165 ultramarathoner. #448 runner. #439 fundraiser. #3 team fundraisers. Finished in 448th place. #66 ultramarathoner. #126 runner. #94 fundraiser. #1 team fundraisers. Longest personal streak grows to 32 days at 2.25 miles/day. #447 runner. #500 fundraiser. #3 team fundraisers. Longest personal streak grows to 4 days at 4.12 miles/day. Finished in 447th place. Ran 26.2 miles (+0.3 miles) in 25 days a PR. #446 runner. #80 fundraiser. #2 team fundraisers. 5th Longest personal run. Finished in 446th place. Ran 26.2 miles in 12 days a PR. #65 ultramarathoner. #91 runner. #100 fundraiser. #1 team fundraisers. 4th Longest personal streak grows to 4 days at 1.37 miles/day. #445 runner. #206 fundraiser. #1 team fundraisers. 7th Longest personal run of this race. Finished in 445th place. 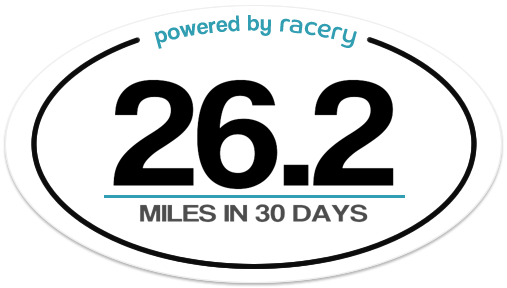 Ran 26.2 miles (+0.9 miles) in 30 days a PR. #25 ultramarathoner. #19 runner. #21 fundraiser. #4 team fundraisers. 8th Longest personal run. Ran 26.2 miles (+2.6 miles) in 3 days a PR. #444 runner. #123 fundraiser. #1 team fundraisers. Back after 7 days. 2nd Longest personal run. Finished in 444th place. #443 runner. #26 fundraiser. #4 team fundraisers. Longest personal run. Finished in 443rd place. #442 runner. #573 fundraiser. #4 team fundraisers. Longest run in race this week. Back after 138 days. 2nd Longest personal run. Finished in 442nd place. #82 ultramarathoner. #116 runner. #568 fundraiser. #4 team fundraisers. #98 ultramarathoner. #190 runner. #283 fundraiser. #2 team fundraisers. 10th Longest personal run. #441 runner. #39 fundraiser. #3 team fundraisers. 5th Longest personal run. Finished in 441st place. Ran 26.2 miles (+0.1 miles) in 30 days a PR. #8 ultramarathoner. #11 runner. #295 fundraiser. #2 team fundraisers. #8 ultramarathoner. #11 runner. #295 fundraiser. #2 team fundraisers. 5th Longest personal streak grows to 4 days at 10.70 miles/day. #2 ultramarathoner. #6 runner. #122 fundraiser. #1 team fundraisers. #14 ultramarathoner. #17 runner. #485 fundraiser. #3 team fundraisers. 5th Longest personal run of this race. Longest personal streak grows to 281 days at 5.10 miles/day. #78 ultramarathoner. #166 runner. #248 fundraiser. #2 team fundraisers. Longest personal streak grows to 32 days at 1.89 miles/day. Ran 26.2 miles (+0.7 miles) in 13 days a PR. #40 ultramarathoner. #41 runner. #237 fundraiser. #2 team fundraisers. Longest personal streak grows to 743 days at 5.61 miles/day. #440 runner. #2 fundraiser. #1 team fundraisers. 4th Longest personal run. Finished in 440th place. Ran 26.2 miles (+1.6 miles) in 32 days a PR. #439 runner. #215 fundraiser. #1 team fundraisers. 2nd Longest personal run. Finished in 439th place. #489 runner. #215 fundraiser. #1 team fundraisers. 10th Longest personal run of this race. #32 ultramarathoner. #150 runner. #577 fundraiser. #2 team fundraisers. 3rd Longest personal run. #54 ultramarathoner. #93 runner. #352 fundraiser. #2 team fundraisers. 5th Longest personal run of this race. #75 ultramarathoner. #107 runner. #491 fundraiser. #3 team fundraisers. 5th Longest personal run of this race. 2nd Longest personal streak grows to 32 days at 2.27 miles/day. #65 ultramarathoner. #216 runner. #581 fundraiser. #2 team fundraisers. 10th Longest personal run of this race. Longest personal streak grows to 20 days at 3.58 miles/day. 2nd run of the day. #438 runner. #20 fundraiser. #2 team fundraisers. 10th Longest personal run. Finished in 438th place. #437 runner. #3 fundraiser. #2 team fundraisers. Finished in 437th place. #4 ultramarathoner. #18 runner. #233 fundraiser. #3 team fundraisers. #7 ultramarathoner. #16 runner. #34 fundraiser. #3 team fundraisers. Longest personal streak grows to 15 days at 8.87 miles/day. #29 ultramarathoner. #239 runner. #396 fundraiser. #3 team fundraisers. #435 runner. #3 team fundraisers. Longest personal run. Finished in 435th place. Ran 26.2 miles (+2 miles) in 13 days a PR. #563 runner. #151 fundraiser. #1 team fundraisers. Back after 18 days. 2nd Longest personal run. Passed 4 runners. #51 ultramarathoner. #23 runner. #184 fundraiser. #1 team fundraisers. #179 ultramarathoner. #434 runner. #191 fundraiser. #1 team fundraisers. #458 runner. #499 fundraiser. #3 team fundraisers. 2nd Longest personal run of this race. Passed 20 runners. #433 runner. #465 fundraiser. #3 team fundraisers. Finished in 433rd place. Ran 26.2 miles (+0.9 miles) in 28 days a PR. #432 runner. #3 team fundraisers. Longest personal streak grows to 4 days at 5.88 miles/day. Longest personal run. Finished in 432nd place. #87 ultramarathoner. #159 runner. #474 fundraiser. #3 team fundraisers. Ran 26.2 miles (+0.8 miles) in 14 days a PR. #468 runner. #574 fundraiser. #2 team fundraisers. 4th Longest personal run. Passed 12 runners. #23 ultramarathoner. #49 runner. #134 fundraiser. #1 team fundraisers. 2nd Longest personal streak grows to 32 days at 5.02 miles/day. #142 ultramarathoner. #170 runner. #257 fundraiser. #2 team fundraisers. Longest personal streak grows to 5 days at 1.69 miles/day. 5th Longest personal run. #459 runner. #204 fundraiser. #1 team fundraisers. 9th Longest personal run. Passed 11 runners. #122 ultramarathoner. #229 runner. #41 fundraiser. #1 team fundraisers. 10th Longest personal run. #431 runner. #164 fundraiser. #1 team fundraisers. Longest personal streak grows to 4 days at 2.00 miles/day. Longest personal run. Finished in 431st place. Got a double workout in today! Go Blue! #6 ultramarathoner. #26 runner. #287 fundraiser. #2 team fundraisers. Longest personal streak grows to 32 days at 8.47 miles/day. Longest personal run. #430 runner. #179 fundraiser. #1 team fundraisers. Back after 8 days. 2nd Longest personal run. Finished in 430th place. Ran 26.2 miles (+0 miles) in 29 days a PR. #429 runner. #82 fundraiser. #3 team fundraisers. 3rd Longest personal run of this race. Longest personal streak grows to 4 days at 6.75 miles/day. Finished in 429th place. Ran 26.2 miles (+0.8 miles) in 4 days a PR. #181 ultramarathoner. #336 runner. #235 fundraiser. #3 team fundraisers. #487 runner. #472 fundraiser. #3 team fundraisers. 4th Longest personal run of this race. Back after 5 days. Passed 9 runners. #463 runner. #403 fundraiser. #2 team fundraisers. 7th Longest personal run. Passed 10 runners. #428 runner. #3 team fundraisers. Finished in 428th place. #427 runner. #8 fundraiser. #1 team fundraisers. Longest personal streak grows to 9 days at 1.94 miles/day. Finished in 427th place. Ran 26.2 miles (+0.8 miles) in 16 days a PR. #433 runner. #3 team fundraisers. 5th Longest personal run of this race. Passed 11 runners. #143 ultramarathoner. #218 runner. #267 fundraiser. #2 team fundraisers. #56 ultramarathoner. #120 runner. #107 fundraiser. #1 team fundraisers. 3rd Longest personal streak grows to 4 days at 2.45 miles/day.